The heady world of gambling has produced more than a few notable female stars, one of whom went by a multitude of names in her time; Charlotte Tompkins, Charlotte Thurmond, Mystic Maud, “The Angel of San Antonio”, and “Queen of the Pasteboards.” Of course, none of those were her real name, which is thought to have been Carlotta J. Thompkins – though she was mostly known by the much more demure Lottie Deno! Lottie was born on the 21st April 1844, in Warsaw, Kentucky, and grew up on her father’s plantation. He was also a racehorse breeder and an avid gambler, and took Lottie with him on trips to some of the most prestigious casinos of the day, where he taught her how to maintain an effective poker face and play cards like a pro – my word, how acceptable parenting has changed! Unfortunately, Lottie’s father was killed in the American Civil War, after which her mother sent her to Detroit to ‘find a husband’ – as you do. She was, apparently, accompanied on the expedition by her nanny, a certain imposing Mary Poindexter. But things didn’t go according to her mother’s plan, because she soon ran out of money, and embarked on a gambling life on the paddle steamers and riverside casinos of the Mississippi River – accompanied by her faithful bodyguard, the might nanny Poindexter! After arriving in San Antonia in 1865, Lottie got a job as a house gambler, working for the Thurmond family, at the University Club. There she met, and fell for, Frank Thurmond – also a gambler. It was here that the movie-worthy portion of her life really got going. Frank was accused of murder and ran (though no one really knows if he was guilty), and Lottie ran with him. They hightailed it across western Texas for years, keeping one step ahead of the law in the rough and ready frontier. Finding the frontier towns like Fort Concho, Jacksboro, San Angelo, Denison, Fort Worth, and Fort Griffin awash with cowboys with money to lose, Lottie earned her reputations as the coolest poker player in the west, even rubbing shoulders with legends like Doc Holiday, earning her a firm place in the folklore of the Wild West. From contemporary accounts, it seems that Lotti was perfectly calculated and aware of how to use her good looks to disarm her poker opponents, lulling them into a false sense of security, and distracting them, whilst she deftly out-played them and cleaned up. So, what happened to our western poker duo, did they see out their days in the saloons and casinos of the old west? In 1877 Lottie and Frank moved to New Mexico, and wound up running a gambling room at the Victoria Hotel in Kingston. She later ran a restaurant in Silver City, where she and Frank got married, at long last in 1880. In 1882 Lotti and Frank gave up on their lucrative gambling life, moved to Deming, and settled down, where he became a vice president of a bank, and she helped found a church! Lotti died on February 9th 1934 – but she will always live on forever as an icon of the fast and free Wild West. 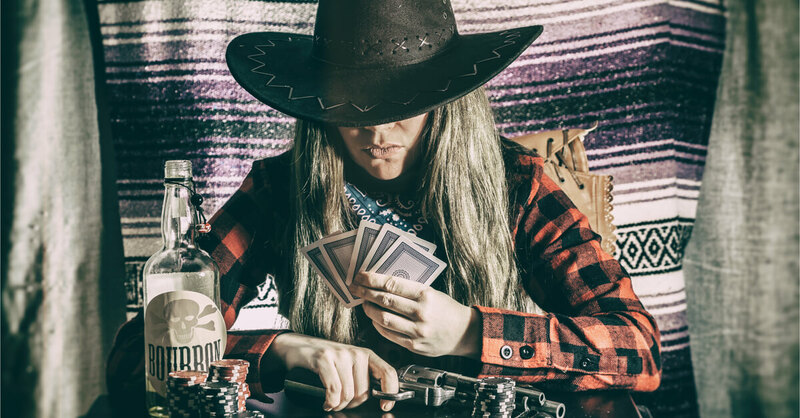 So, next time you watch a cowboy movie, remember that, in real life, some of the most formidable poker players were women!